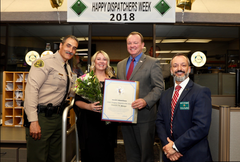 Since 1991, Congress passed a formal proclamation to annually honor public safety dispatchers in the month of April as “National Telecommunicators Week.” During this week, telecommunicators throughout the nation are recognized for their outstanding efforts and devotion to the communities they serve. 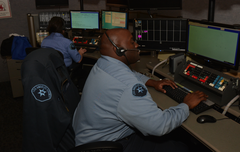 Many times public safety telecommunicators are the first line of assistance when the community calls into their dispatch. Although they are rarely seen and heard by the public, dispatchers are the behind-the-scenes link between those in need and those who can help. They are the voice of calmness and composure, keeping the airwaves organized during even the most dynamic of events. 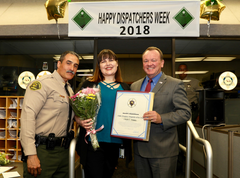 As a result, we celebrate and honor our dispatchers one week each year by recognizing their contributions to helping keep our country, personnel and public safe. The Sheriff’s Communication Center dispatchers and law enforcement technicians assigned to special desk operations consistently demonstrate a high-level of performance and devotion to their telecommunicator duties. Dispatchers handle almost 5,000 deputy emergencies a year, averaging 14 times per day they coordinate events such as assistance requests, pursuits, containments, deputy-involved fights, and even deputy-involved shootings 14 per day. They perform fluidly during intense, dynamic events, and even offer a little humor during the less-stressful moments. For deputies working out in the field, the dispatchers’ voices and personalities become familiar over the years, and even though they will likely never meet, the dispatchers seems like longtime friends. Samantha Belanger was hired as a Public Radio Dispatcher by the Department in November, 2009 and is currently assigned to dayshift. She passionate about sharing her knowledge with others and took the position as a training officer to help craft more conscientious dispatchers. Samantha has mentored several new dispatchers since 2011 and helped four of them complete the demanding training process. Nicole Simons was hired as a Public Radio Dispatcher by the Department in June, 2006 and is currently assigned to early morning shift. As a tenured dispatcher, she also guides new dispatchers and trained several since 2008, with three of them completing the training process. If you are interested in becoming a Public Radio Dispatcher or wish to share your skills of another class, have we got a career for you! Check out the variety of sworn and professional positions available at http://lasdcareers.org/joinlasd/. Text & Email, Register for LASD Nixle messages: To receive more detailed, up-to-date information via E-MAIL and/or TEXT directly from the Los Angeles County Sheriff’s Department (LASD), sign up for "Nixle" alerts at http://www.Nixle.com and register for "LASD – Los Angeles County Sheriff’s Dept Information Bureau (SIB)" AND your local LASD station area. Or, to receive URGENT TEXT ALERTS ONLY, text your zip code to 888777. Standard text messaging rates may apply depending on your calling plan. "If You See Something, Say Something"
LA Crime Stoppers: Partner to prevent or report crime by contacting your local Sheriff’s station. Or if you prefer to provide information anonymously, you may call "Crime Stoppers" by dialing (800) 222-TIPS (8477), use your smartphone by downloading the “P3 Tips” Mobile APP on Google play or the Apple App Store or by using the website http://lacrimestoppers.org.